The steady and oscillatory dynamics of binary fluids contained in slots heated by the side is studied by using continuation methods, and stability analysis. The bifurcation points on the branches of solutions are determined with precision by calculating their spectra for a large range of Rayleigh numbers. 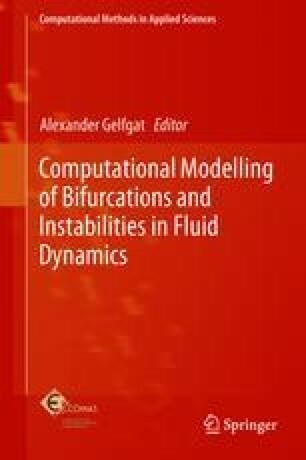 It will be seen that continuation and stability methods are a powerful tool to analyze the origin of the hydrodynamic instabilities leading to steady and time periodic flows, and their dynamics. The role played by the shear stresses of the steady field, and the solutal and thermal buoyancies, at the onset of the oscillations is studied by means of the energy equation of the perturbations. With the parameters used, it is found that the shear is always the main responsible for the instabilities, and that the work done by the two buoyancies can even help to stabilize the fluid. The results also show that binary mixtures of Prandtl number order one, like pure gases, present multiple stable periodic flows coexisting in the same range of parameters, since several unstable leading multipliers remain attached to the unit circle and go back into it. However, at lower Prandtl numbers only the first branch of periodic orbits bifurcating directly from the steady state is found to be stable, because some of the unstable multipliers of the other branches quickly increase their modulus and never re-enter the unit circle. This work has been supported by Spanish MCYT/FEDER and Catalan GENCAT grants FIS2016-76525-P and 2017-SGR-1374, respectively.